First off, Happy New Year! Second off, this post is not meant to beat up on 7-Eleven. Really. But for pete's sake...we're only two days into 2013 and already here's another reminder of 'The Wheel Stop Follies'. 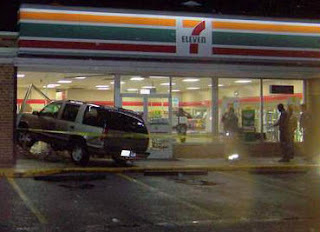 This 7-Eleven in Chesapeake, Virginia, got nailed this morning by a driver who put her SUV in drive instead of reverse (see WAVY News). Is the driver to blame? Yes! But this kind of mistake is so common, no business with nose-in parking spaces can think it's immune from such accidents — especially not one with as many stores and as many storefront crashes under its belt as this one. Moreover, no 'nose-in' parking space should have only a shallow bumper stop between it and the storefront. While the proverbial picture is worth a thousand words, this one is worth just seven: "Wheel stops don't 'stop' a moving vehicle." When this driver put her SUV in 'drive' and crashed forward through the window, who knows if she had even pressed the accelerator yet before the vehicle moved forward. Either way, there was nothing there to stop her vehicle from quickly causing damage to the store. Luckily, no one was injured in this one. WAVY reported that, "The 7-Eleven will be closed until further notice and the crash remains under investigation." So, just to summarize: (a) A zillion-dollar company put nothing but wheel stops between its customers' cars and its store. (b) The wheel stops (as usual) didn't prevent a vehicle from crashing into the storefront. (c) Said zillion-dollar company lost revenue from having to close, incurred significant property damage, and was just lucky no one (including its employees) got hurt. Again, 'not beating up on 7-Eleven. It's just one of many brands putting its property and people at risk by apparently trusting in wheel stops.